KATE completed her RSN Apprenticeship with distinction in 2009. Prior to this she studied for a degree in Art for Public Space at Roehampton University. Along with teaching for the RSN, Kate also runs her own business called Bespoke Embroidery. Within this business she takes on both public and private commissions and teaches privately and in higher education establishments. Kate believes that excellent teaching is fundamental to retaining the heritage and skill level in embroidery and has obtained her Post Graduate Certificate in Education. Her mantra for teaching is “embroidery is enjoyable, fun and visually exciting”. 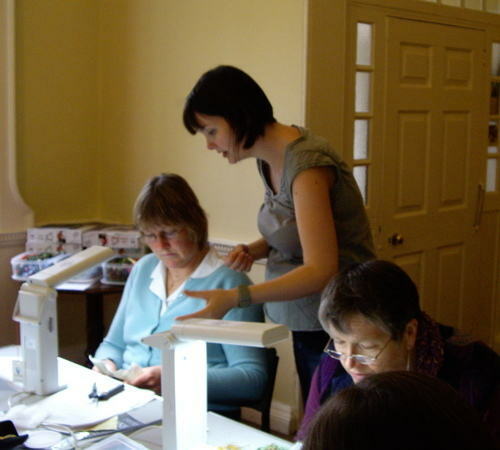 Kate teaches RSN Day Classes and on the RSN Certificate and Diploma at Hampton Court Palace. Lisa works as a freelance embroiderer and tutor currently based in west London. Lisa's undertakes a variety of commissions for private clients and the RSN. Before commencing her embroidery studies at the Royal School of Needlework as an Apprentice in 2001, she completed a degree in Costume Design and Production at Bournemouth Art Institute. Lisa teaches on the RSN Day Class programme. Alexandra completed her apprenticeship at the Royal School of Needlework in 1998. She then achieved a BA Honours degree in archaeology from the University of Newcastle-upon-Tyne before going on to gain her PGCE in Design Technology. She has Qualified Teacher Status with nine years experience teaching and co-ordinating Design Technology within secondary schools. Alexandra also achieved an MSc in Education and is now studying for a PhD at the University of Manchester. Her thesis title is: Embroidery and its context in the British Isles during the early medieval period (AD 450-1100). Alexandra’s research is an interdisciplinary analysis of the surviving embroideries. The primary focus is to re-evaluate published and non-published information, and to re-examine the embroideries to gain further technical insight into how they were designed, created and used. They are studied visually and microscopically. The data will form the first detailed catalogue of the surviving pieces. The second aim is to examine the embroideries and their creators to understand how they were regarded by early medieval society; both will be placed within the wider material culture of the period. This will be achieved by analysing contemporary sources and archaeological evidence. 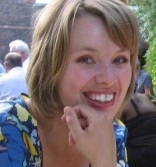 Alexandra organises and runs the University of Manchester based Dress and Textile Discussion Group. She has also taught workshops on a variety of embroidery techniques and lectured on early medieval embroidery. She has attended various conferences and symposia, including Opus Anglicanum at the Victoria and Albert Museum, where she has presented papers, and organised and chaired sessions. Alexandra has published a number of articles and is in the process of writing a chapter, ‘The Front tells the Story; the Back tells the History: a technical discussion of the embroidering of the Bayeux Tapestry’, for a forthcoming book, Making Sense of the Bayeux Tapestry: Readings and Reworkings. Recently Alexandra was interviewed about her research on Radio 5 Live and Radio 4. She also appeared on ‘Time Team Special: 1066 the Lost Battlefield’.